Partnership with Dusun Electron introduces low cost, intelligent car park application to reduce parking congestion and to increase revenues for car park operators. GreenPeak Technologies, the leading low power RF semiconductor company, and Dusun Electron Ltd, a rapidly growing electronic company focusing on development of wireless internet technology and pioneering the Internet of Things (IoT) industry in China, today announced their partnership with the launch of their first Smart City assisted parking application that addresses the growing parking problems in China’s larger cities. The number of cars in Beijing has grown quickly as urbanization and modernization have progressed. Today, the capital has over 5 million registered vehicles and only 1.5 million available parking spaces. Chinese ministries are launching major programs focused upon achieving sustainable urban development. The Chinese Smart City initiatives, driven by national and local governments, are intended to improve efficiency of cities and aim to achieve environmental, economic and social sustainability through the systematic integration of ICT solutions into their planning, design, operations and management. GreenPeak Technologies and Dusun Electron have launched a Smart Parking application for smart phones that guides car drivers to an available parking space. Based on individually selected criteria such as the walking distance to the destination from the parking space and the parking tariff selected, the application guides the user to the nearest available parking space in just a few clicks. Inside the parking lot, every parking space is equipped with a wireless sensor that detects if the parking space is empty and reflects availability in floor and row signage on car guidance displays. 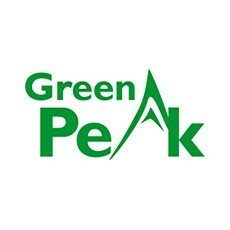 GreenPeak Technologies has developed the sensor technology, the radio chip and the networking technology. Building on this, Dusun Electron has developed the cloud infrastructure and Smart Parking application. The gateway sends the parking availability information to the cloud environment where the data is analyzed for display in the mobile app and parking location signage. GreenPeak’s solution provides the low cost communication system and easy to install software. One of the GreenPeak advantages is the long battery life of over 5 years for the wireless sensors. GreenPeak’s patented radio technology guarantees best range and optimal signal quality, even in concrete and steel parking lot structures. The benefits for car park operators are significant: low cost installation due to absence of wiring, low cost maintenance due to long battery life, easy and reliable operation due to the self-learning algorithms in the sensors, and high detection reliability. Additionally, the system provides opportunities to further enhance the application with value added services (e.g. flexible/peak pricing and online reservation system) to further optimize revenues. The first implementation of the system is developed for use in the Smart City program of the city of Wuxi, Jiangsu province. “A critical key to solving congestion problems is by better organizing traffic. Streamlining the process for people to find parking spaces is essential for enhanced and controlled vehicle routing and reducing unnecessary traffic. This new system requires a small investment and provides a tremendous improvement,” says Cees Links, Founder and CEO of GreenPeak Technologies.